Following a week during which the paper, which sells 2.6 million copies every week, lurched from one crisis to another, management have decided to close the paper. There are approximately 100 commercial staff at the News of the World, though it is understood none of these positions will go. 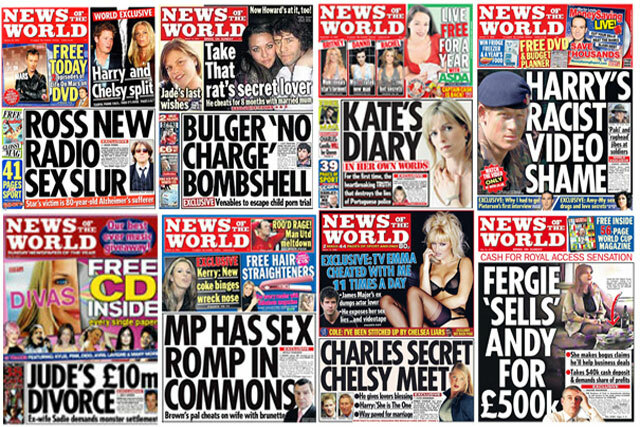 Approximately 200 editorial jobs will go in the closure of the News of the World. A News International spokeswoman said there would be alternative editorial jobs available but was unable to say how many at this stage. Staff consultations have yet to begin, unsurpirisingly given the suddenness of the axe wielded by News Corporation. In response to speculation that The Sun would publish on a Sunday, the spokeswoman said: "That's a matter for the future, we're not commenting beyond the statement today." In a statement to staff that laid bare the failings of the paper, News Corp deputy chief operating officer James Murdoch said: "The News of the World is in the business of holding others to account. But it failed when it came to itself." Murdoch said all revenue this weekend "would go to good causes". He said: "While we may never be able to make up for distress that has been caused, the right thing to do is for every penny of the circulation revenue we receive this weekend to go to organisations – many of whom are long-term friends and partners – that improve life in Britain and are devoted to treating others with dignity. These are strong measures. They are made humbly and out of respect. I am convinced they are the right thing to do." The paper has been in crisis since allegations broke earlier this week, by the Guardian, that it hacked into the phone of murdered schoolgirl Milly Dowler. These allegations were met with public outrage and brought calls from prime minister David Cameron for a public inquiry into press practices, and a further inquiry into the police's handling of the original investigation into the phone-hacking scandal. The public mobilised support through social networks to target advertisers, pushing them to withhold advertising from the paper in protest. Those protests have resulted in far more than a boycott of the paper by clients. The unprecedented step to shelve a national newspaper with a 168-year history has brought amazement from members of the media industry. Amy King, head of press at MPG Media Contacts, said: "This is the biggest thing that has happened in my career. "It's a strange day for newspapers, but there are many clients that had already pulled out and how long would that go on for? It wouldn’t take them a couple of weeks to change their mind, and if this situation had gone to court it would have been months or years of legal battles." The News of the World is the biggest-selling Sunday newspaper, with a circulation of 2,657,232 copies in May, according to ABC data. The earliest ABC-audited circulation figure for the title dates back to July 1962, when it was 6,662,389. It first fell below six million copies in 1972, three years after it was bought by Rupert Murdoch. The paper made statements to Parliament without being in the full possession of the facts. This was wrong. The Company paid out-of-court settlements approved by me. I now know that I did not have a complete picture when I did so. This was wrong and is a matter of serious regret. You may see these changes as a price loyal staff at the News of the World are paying for the transgressions of others. So please hear me when I say that your good work is a credit to journalism. I do not want the legitimacy of what you do to be compromised by acts of others. I want all journalism at News International to be beyond reproach. I insist that this organisation lives up to the standard of behaviour we expect of others. And, finally, I want you all to know that it is critical that the integrity of every journalist who has played fairly is restored.